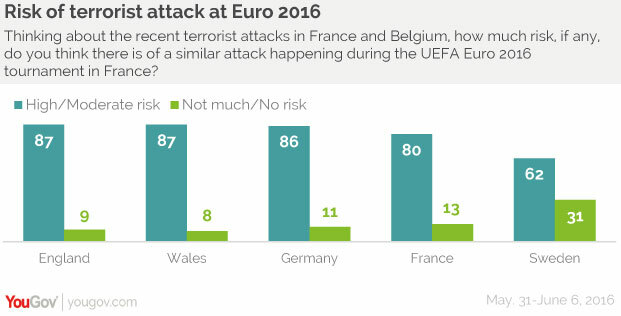 den Juni 9, 2016, 11:36 a.m.
A big majority of football fans across Europe think there is a moderate or high risk of a terrorist attack happening at Euro 2016, but a similar majority think the tournament should go ahead. Euro 2016 begins in France this weekend, amidst the backdrop of a nation that has been under a state of emergency since the terrorist attacks in Paris last November. Speculation on the viability of the tournament has been rife since those attacks however organiser Jacques Lambert dismissed talk that the tournament could be cancelled completely in the days following the attacks, stating cancelling the tournament is “playing the game of the terrorists”. Research from five countries competing in this year’s competition shows that fans think there is a significant risk of a terror attack, but they believe it is a risk worth taking. Clear majorities in England (87%), Wales (87%), Germany (86%), France (80%) and Sweden (62%) think there is a high or moderate risk of a similar attack to those seen recently in France and Belgium. However, football fans across Europe remain defiant in the face of the perceived risk, with strong majorities agreeing that it is the right decision for the tournament to go ahead. Over 80% of fans in all five countries think it was the right decision for the tournament to go ahead, rather than move it elsewhere or cancel it completely. Support for the tournament going ahead is marginally smallest in the host nation, France, where 80% think it is the right decision and 12% think it should have been cancelled or postponed. The tournament kicks off on Friday evening as France take on Romania in the Stade de France, the site of one of the November attacks. 90,000 security staff will be deployed for Euro 2016, including 42,000 police, 30,000 gendarmes and 10 000 soldiers in combat uniform.